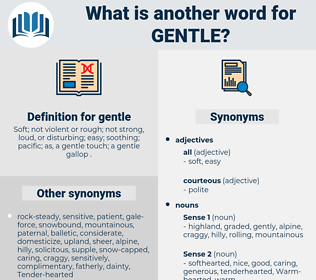 What is another word for gentle? Soft; not violent or rough; not strong, loud, or disturbing; easy; soothing; pacific; as, a gentle touch; a gentle gallop . lenient, moderate, slight, gracious, pleasant, lovely, modest, delicate, thoughtful, amiable, balmy, good-natured, light-touch, Kind-hearted, lightweight, quiet, polite, light, warm, lovable, wonderful, benign, sensitive, charming, subtle, loving, cute, generous, fleecy, noble, discreet, cautious, idealistic. rough, agitated, hard, callous, violent, irritable, healthy, sharp, excited, surly, harsh, cruel, hateful, mean, odorous, unfeeling, unfriendly, troubled, unkind, putrid, merciless, crude, disagreeable, strong, unhappy, low, severe, wild, loud, uncompassionate. boisterous, heavy, Roused, noisy, intelligent, smart, fierce, coarse, turbulent, uncontrolled, significant. unsophisticated, impolite, unrefined, unmannerly, uncivil. morose, lowborn, illegitimate, squally, squealing, dirty, lower class, blustering, gloomy, dogged, sullen, degraded, hazy, ill-natured, clear, ill-humored, strident, junior, sour, exquisite, inclement, gray, abrasive, forceful, overcast, pitiless, ordinary, Unamiable, nasty, stormy, vociferous, shrill, knavish, churlish, rugged, showery, crusty, foul, Overloud, rainy, clarion, powerful, sunless, unlovely, subordinate, rude, roughened, gusty, obstreperous, acrimonious, ill-tempered, foggy, Dinning, rip-roaring, intemperate, forcible, untamed, misty, irritating, crabbed, blustery, bleak, raucous, windy, breezy, crashing, dismal, plain, cloudy. They were not gentle men. His voice was gentle - very gentle, but sad.